Perhaps you were having a fun night out and things got a little out of hand. Maybe you were simply in the wrong place at the wrong time. Whatever led to your arrest, you undoubtedly are not looking forward to spending any time behind bars. Once you are booked and the judge determines your bail amount, you have the chance to post bail and be let out of jail. As your local bondsmen in Roanoke County, we have years of experience helping people who find themselves in need of an affordable bail option. We have also witnessed people who try to navigate the system alone and run into a myriad of issues. Check out the following list of the five things you should never do when posting bail and contact us for help night or day. We will work quickly to get you out of jail. If you were just issued your bail amount and the number has left you feeling hopeless, you might give up and resign yourself to sitting in jail. It is often the case that the cost of bail is far too high for the average person to afford. When you don’t have thousands of dollars to spare, you can be left assuming that you have no means for leaving jail. While you might not be able to afford the cost of bail on your own, don’t let the amount leave you in a panic. 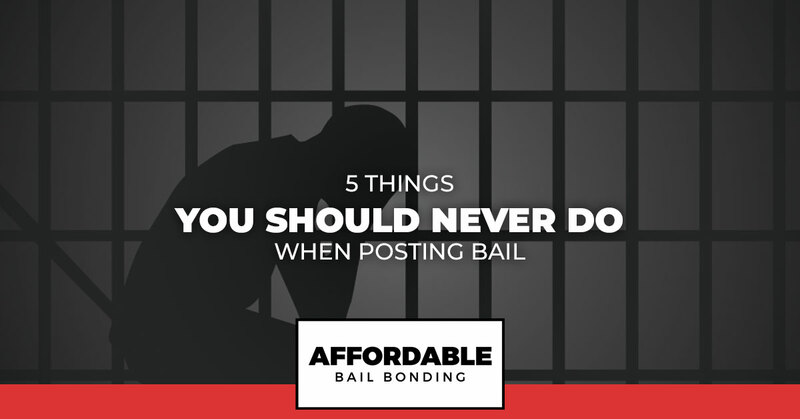 The good news is that there are options for posting bail that are more affordable than the bail amount you were told. One method for affording bail is to work with a bail bondsman. A bail company will only ask you to pay a percentage of the bail amount rather than the full amount. They will retain this fee but in return, they will post the rest of your bail. So if your bail amount is set at $5,000 you will only pay around 10 percent of that amount. If a percentage of your bail amount is still too high, you can still ask about financing from the bail bond company. Here at Affordable Bail Bonding, we are happy to work with you to find a financing option that fits your needs. The bottom line? Don’t let a high bail amount keep you in jail. Another mistake many people make is spending far more time behind bars than they need to. This is usually due to a few reasons. For starters, those who try to post bail on their own may struggle to navigate the system. Perhaps your family is helping you out but they have no clue how to go about posting your bail. This can result in a slow bail process, leaving you behind bars longer than needed. Working with a bail bondsman will expedite the process as they have experience with the process. Another reason people might delay in posting bail is that they think they need to wait until normal business hours to contact a bail company. The reality is that bondsmen work night and day. You can call our team regardless of the hour and we can get to work on the bail process. If you contact a bail bondsman and they treat you with anything less than professionalism and respect, you should find a new agent. You do not need to be treated with disdain. Being arrested is stressful enough on its own. Look for a bail bondsman who is going to treat you kindly and who will work hard to get your bail posted as quickly as possible. When working with a bail bondsman, make sure that you fully understand any contracts you are signing. Take the time necessary to read through the paperwork and ask questions if you are uncertain about anything in the contract. A good bail bondsman should be willing to help you understand everything you are signing. If someone is trying to pressure you into quickly signing paperwork without fully reading the contract, be wary. Last, but most definitely not least, never skip your court date once you have posted bail. Skipping out on your court date will result in a warrant for your arrest and further charges against you. Not only that, but when you skip out on bail you are breaking your contract with your bail bondsman as well. It is important to instead stay positive, prepare for your trial with a lawyer, and show up for your court date. The best thing you can do is build a strong defense for yourself and abide by the law until the day of your trial. While it might feel overwhelming at first, there is a light at the end of the tunnel if you show up for trial. If you are looking for bondsmen in Roanoke County to help you post bail, our team is here to help. We offer affordable bail bonds and you can count on the fact that our staff will treat you with kindness and respect. We understand how stressful it can be when you are facing arrest. Our goal is to alleviate as much stress as possible and to get you out of jail quickly. With years of experience on our side, we can work quickly and efficiently to get you back home with your loved ones. Contact us today for further assistance.